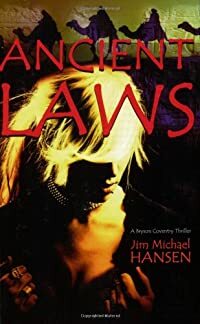 Ancient Laws by Jim Michael Hansen, a Mysterious Review. Review: Homicide detective Bryson Coventry travels to Paris, where a woman has been killed in a manner similar to that in one of his unsolved murder cases in Denver, in Ancient Laws, the eighth mystery in this series by Jim Michael Hansen. The case is personal to Coventry, as he had inadvertently revealed the name of a witness to the crime, a woman that has since gone into hiding. Imagine his surprise, and horror, when, arriving in Paris, he discovers the dead woman is the witness, who was living in the city under an assumed name. He teams up with a French detective, Fallon Le Rue, with whom he establishes an instant, call it "rapport", and together they are determined to catch this killer, even if it means using Fallon as bait. As is typical of this series, the author not only alternates chapters between three points of view, but also creates three storylines that eventually converge. The second point of view and storyline involves the murder of an archeologist, Remy Lafayette. A mysterious woman who knew Remy in Egypt, Alexandra Reed, believes he was murdered by someone looking for a map — a map to ancient treasure. When Lafayette's niece, Jade, finds her apartment ransacked, she teams up with Alexandra to find the map and, in doing so, to identify Remy's killer. The third point of view is that of a private investigator, Marcel Durand, hired by a wealthy shipbuilder, Nicholas Ringer, to help Jade find her uncle's killer. This all has the potential to be confusing but the author handles it reasonably well, keeping the chapters relatively short and to the point, moving the various subplots forward at a brisk pace, even giving the characters a change of scenery by moving the action from Paris to Egypt. At times improbable and superficial, and maybe featuring just a few too many snakes (a metaphor, possibly? ), it's all finally linked together in a logical, reasonable manner. But the book ends on a somewhat ominous note. With Ancient Laws the author seems to be signaling a change, possibly a significant change, to the future direction of the series. The premise for Coventry being in France in the first place is tenuous, and how he spends his time there (at the expense of Denver taxpayers) is rather disturbing, being more interested in, and spending more time lusting after, his French colleague than his stated purpose of pursuing a killer. Though the ending is ever so slightly ambiguous in this regard, it's possible that in the next book in this series (already announced to be Hong Kong Laws), Denver homicide detective Bryson Coventry may not be a Denver homicide detective any more … a potentially disappointing development for readers. It will be interesting to see how this plays out. Acknowledgment: Jim Michael Hansen provided a copy of Ancient Laws for this review.